Transhuman Sci-fi Roleplaying for your Traveller Game! 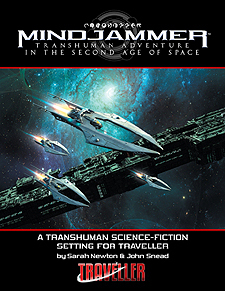 The ENnie Award-winning transhuman science-fiction RPG setting returns in a brand new edition, for use with the Traveller roleplaying game! Detailed character cultures, genotypes and new careers - play a sentient starship! The Universe Awaits! Never has there been a greater time of opportunity. The universe is in flux, and for the first time in ten thousand years no one knows what the future will bring. Charge your blaster, thoughtcast your orders to the starship sentience and fire up the planing engines. Come and defend the light of humanity's greatest civilisation as it spreads to the stars! Requires the use of the Traveller Core Rulebook. High Guard and the Central Supply Catalogue are also recommended.